Agastache aurantiaca (aurantica) is a species that occurs naturally in the mountain areas of Mexico, it tolerates more moisture than other species, and is widely used in hybridisation. 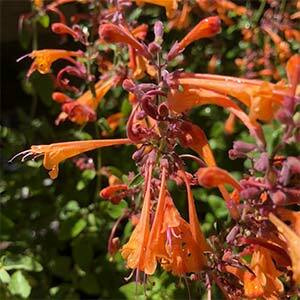 Varieties such as Agastache aurantiaca ‘Tango’ make an excellent addition to any garden and thrive in a dry garden area. Plant them along with Lavender, Monarda, Echinacea, Coreopsis, Achillea and Rudbekia. Like other species the common name is ‘Hummingbird Mint’, and it will attract bees, butterflies and nectar seeking birds to the garden. Most varieties have flowers that are shed of orange, we list a few below. Propagation is from seed and the seeds do germinate fairly easily. They are seed that requires good light to germinate so the following procedure is used to grow Agastache aurantica ready for spring planting. Use a free draining soil mix. Fill pots or cell trays with the mix and gently press down. Sow the seed directly onto the surface. Gently press the seed down so that it is good contact with the soil. Grow on until they reach a good size, ready to transplant into the garden. Plant out after the danger of frosts has passed. You can also choose to sow seeds directly in autumn and let mother nature do its thing. Most varieties will not flower in the first year. To maintain vigour, divide clumps very early in spring or very late in summer in warmer climates.